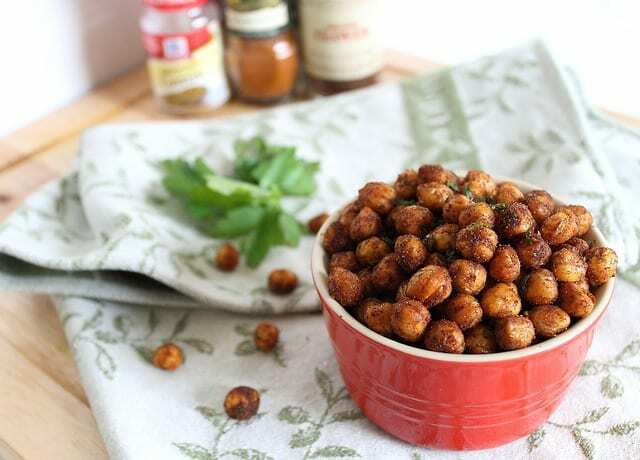 These spicy cinnamon roasted chickpeas are a definite sweet and savory crowd-pleaser for parties or a delicious snack. Watch the quick and easy video on how to make the BEST roasted chickpeas out there. There’s 2 secret tips you don’t want to miss! Let’s count the ways in which yesterday was bizarre. 1. I woke up 30 minutes before my alarm clock and getting out of bed didn’t actually sound like some sick form of ancient torture. Mornings are usually fun around here, can you tell? 2. The work day consisted of 4 conference calls that were actually productive (a highly abnormal occurrence in my job the business world). 3. Ulysses came home from work and declared that we do “a financial analysis”. Um….ok? 4. We let Ginger out after dinner and she came back to the door with a potato. She had no desire to eat it. She just dropped it on her bed as if to say “here mom, I brought this for you. I know you made those goat cheese spinach mashed sweet potatoes recently and like them ” I laughed at the incredible weirdness of that whole situation for at least an hour. Apparently the neighbors must keep potatoes outside? wtf? 5. I ate a smoothie and an entire can of roasted chickpeas for dinner (while doing aforementioned financial analysis). So….chickpeas…roasted. Why the heck haven’t I tried these little nuggets of deliciousness sooner?! 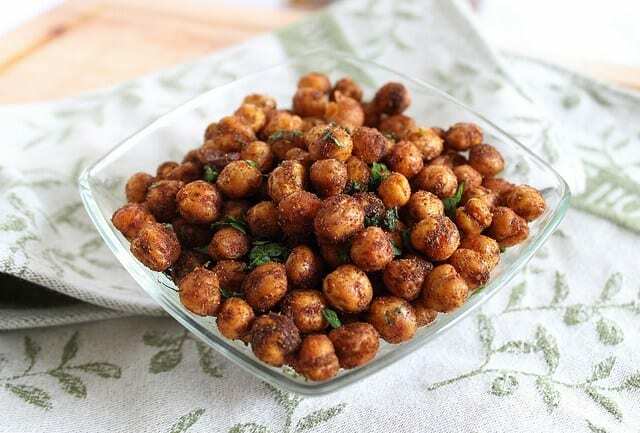 The crunchy exterior of a roasted chickpea is just super addicting and while I like them plain with their typical creamy bean inside, I think roasting them might have won me over. There’s a very specific method to getting the crispiest and crunchiest roasted chickpeas which I talk about in this video tutorial post on how to roast chickpeas – but I’ve also included the video above because no matter what your spice mixture/seasonings are, the method is the same. If you watch the video or read the recipe below, you’ll see there are two secret steps for the ultimate roasted chickpea result. Trust me, they’re worth it, don’t skip them! And, who the heck actually determines the “servings per…” on food products? Because after eating an entire 15oz. can of these for dinner, I can assure them their 3.5 servings per can is off. Especially when you roast them in a spicy cinnamon mixture that tastes like a cross between bar nuts and apple pie. But for every fleck of spice, there was an equal fleck of cinnamon and it freakin’ rocked my taste buds off. If you’d prefer an all sweet route, give these cinnamon toast crunch roasted chickpeas a try. They literally taste just like the cereal and I dare you not to eat the whole pan. 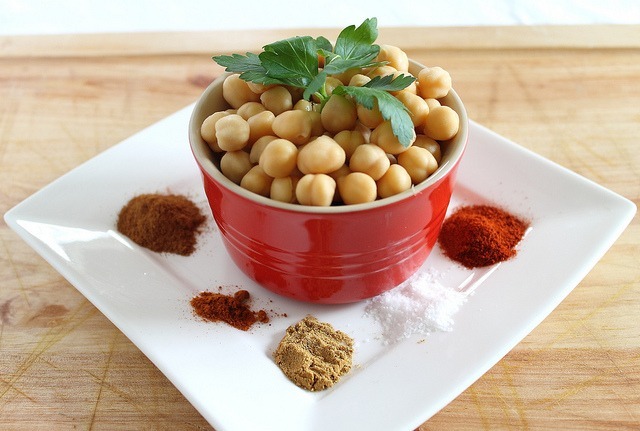 I also have some tips to getting the chickpeas super crunchy in that post! So much so that I didn’t even want to poke my eyeballs out while evaluating our assets and liabilities. These spicy cinnamon roasted chickpeas are a definite crowd-pleaser for parties and a delicious snack. Preheat oven to 400°F convection roast (or 425°F bake if you don't have a convection setting) and spray a baking sheet with cooking spray. Meanwhile, whisk together olive oil and all the spices (except fresh parsley) in a small bowl. Remove chickpeas from oven pour the oil/spice mixture over top. Toss to combine making sure all the chickpeas are evenly coated. Return the baking sheet to the oven and roast an additional 12 minutes, tossing once half way through baking. Turn the oven off, open the door a few inches and let oven cool with the baking sheet still in the oven for at least 10-15 minutes. Once cooled, sprinkle with parsley and pour into serving bowl. Store in a paper bag to retain crispiness if there are any leftover. 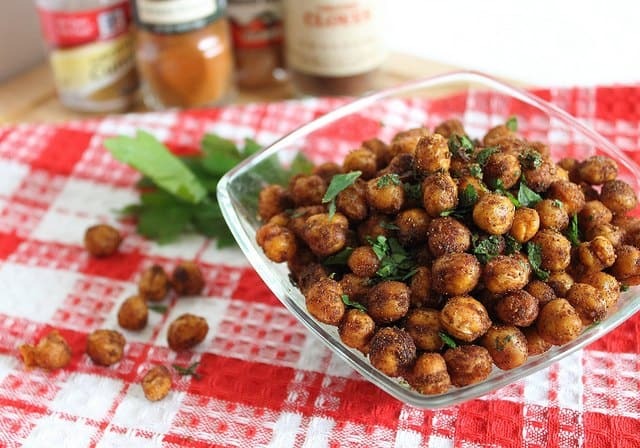 LOOOOVE roasted chickpeas and these look incredible! Lucky for me I have a can in my pantry! I’ve tried roasting these before and they turned hard as rock! I’m going to give it another go. This spice combination sounds unreal! I tried these once (made a sweet version) and ate them in one sitting. Did you “peel” them or roast them with the skins? The potato delivery sounds hilarious! Years ago, I had a neighbor that would leave sweet potatoes in their yard to feed the deer – maybe that’s what is going on near you. Or maybe Ginger has planted a secret garden. I’ve roasted in cinnamon and sugar before but I like your addition of spices! Roasted chickapeas are amazing!! I like to make them spicy! They kind of remind me of corn nuts So good and these are healthy!! Looking forward to trying this recipe…after I stop laughing about the potato. I love roasting chickpeas! They’re so good like that. I love roasted chickpeas. They’re the only reason I have a can of chickpeas around. For hummus and stews and such I start with dried. Roasted chickpeas are incredible. I’ve been wanting to make a new version (other than my go-to bbq chickpeas) – the cinnamon sounds awesome! Love that potato story. Olive went through a phase where she kept stealing potatoes, but unfortunately, it was out of my pantry. And she was trying to eat them raw, not bring them to me. Those look amazing! I have always wanted to try roasting chickpeas but didn’t know if they would be worth it. I now HAVE to try them! I just spit out my tea looking at that picture of Ginger and the potato. Hilarious. I want those chick peas. Time for a trip to the grocery. OH MY GOD. These are totally meant for me (and you). I want to make this this weekend..no lie. Wow, this looks fabulous and I could probably dump that entire ramekin in my mouth and eat it. No judging. I typically find that anything covered in a spicy cinnamon mixture hits the spot!! wink wink….I love posts that have my name in them. I eat chickpeas almost every day, but have never eaten them like this so looks like I’m gonna have to make ANOTHER one of your recipes. You are soo good for my kitchen. And since you mentioned Ginger (another awesome spice girl like me) you have to see this! Wow. I’ve had cinnamon-sugar roasted chickpeas and “spicy” roasted chickpeas but never a combination like this. It sounds so delicious! And I’ve definitely eaten an entire can in one sitting before. No shame! “Serving sizes” are ridiculous anyways…I mean, who only eats 2 tbsp of hummus? Yeah, 3.5 servings is ridiculous. There’s absolutely no way one tiny can of chickpeas could satisfy more than 3 people. Especially not 3 people who love chickpeas as much as this chick does. And now that you posted this recipe, I think I may have a whole new favorite way of eating them by the handful. This sounds awesome! I love the idea of roasted chickpeas that taste like bar nuts and apple pie. Obviously a winning combination. And as luck would have it, I happen to have a can just waiting to be cracked open in my pantry right now. Woohoo! Girl, these look delicious and I could eat them while watching movies for my late night snacks!! YUM!!! I once did chickpeas like this with stevia, cinnamon and chocolate chips! HELLO! Love a tasty and healthy snack!! These chickpeas look perfect! I know, right?! I can’t have them un-roasted anymore either! I added curry to these, and some honey as well. Tastes divine!! Could you exchange the olive oil for fry light? I’m trying to follow slimming world diet and olive oil would kind of dent my plan. I have never heard of “fry light” so I’m not sure. You need some sort of fat to coat the chickpeas to get the same crispy roasted effect.